The Big Missouri group of claims lies astride Big Missouri Ridge about 5 miles due north of Premier. This claim which is the oldest in the Salmon River district, was located in 1904. Prior to 1927 work consisted of the development of visible surface mineralization by open cuts, short adits, and limited diamond drilling. In 1927 the Buena Vista Mining Co. Ltd. assumed control of the group which was being developed by the Big Missouri Mining Co. Ltd., a holding of the Standard Mining Corporation. 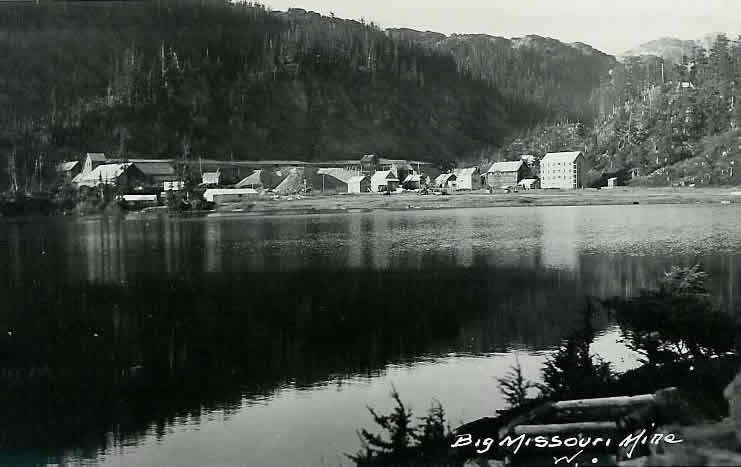 It was at this time that The Consolidated Mining and Smelting Company of Canada, Limited took control and eventually brought the property into production in 1938 from ore bodies on the Providence claim. To facilitate development of the property, a road was built to Premier, a camp and powerhouse erected at Hog Lake, and a small hydro dam constructed at the west side of Long Lake to utilize the Divide Lake-Long Lake storage basin. As part of the mine development scheme, a 750-ton mill was built underground between the 2,100- and 2,300-footlevels, with tailings disposal and surface access on the Salmon Glacier side of the ridge. The present Granduc road now passes over the remains of the surface tramway built to provide transport on the west slope between the 2,300- and 2,800-footlevels. After initiating full production in early 1938 and producing about 850,000tons of gold-silver ore, the property was permanently abandoned in April, 1942. Since then little interest has been shown in the general mine area. The last geological appraisal of the local mineralization was undertaken in 1966 for Falconbridge Nickel Mines Limited (Assessment Report 912) as a project conceived by Carl C. Wikstrom, of Hyder, Alaska.